Just about every kid illness has swept my class this year. Since December, students missed school due to the flu, strep, a throw-up virus, fever virus, that unnamed “yuck” stuff where a child does not run a fever but can barely get his head up off the desk, and lice. I have also had absences for a variety of other reasons. Student absences fall into two categories. Teachers are tolerant about the first group and get irritated about the other. Make-up work is hard on students and teachers. Students never perform as well completing work days after the rest of the class finished it. Logistically, teachers hate tracking the make-up work, and things get overlooked. Bottom line, if it is at all possible to have your kids at school, get them there. Excused Absences: An excused absence is typically due to illness where a child is running a fever, and a doctor note can be provided. At my school, excused absences also include a close family member’s wedding (or funeral), religious holidays, and family emergencies. If parents let the school know about the absence first thing in the morning, most teachers have a Missed Work form. They can gather missed assignments and send it home with a sibling, a neighbor, or leave it at the school’s front desk where a parent can pick it up at the end of the day. Do not expect make-up work before the end of the day. It takes almost the same amount of time I spend teaching a lesson to gather books, make a list of assignments, and provide teacher notes. If a parent requests make-up work be left at the front office, the parent better PICK IT UP. I have arrived at school the day following a student absence to see the pile of books still sitting on the counter in the office. I’m pissed. Organizing sick assignments usually takes an entire planning period. When parents do not collect the work, it makes me feel like they do not have respect for my limited time during the day. If we send work home with a sibling or neighbor, ATTEMPT TO DO THE WORK (see #3). I have kids return from an absence all the time telling me they did not even look at the assignment sheet I carefully completed. Sometimes there are situations where students aren’t able to complete any assignments that go home. Contact the teacher and make arrangements to complete any missed work when the child returns. 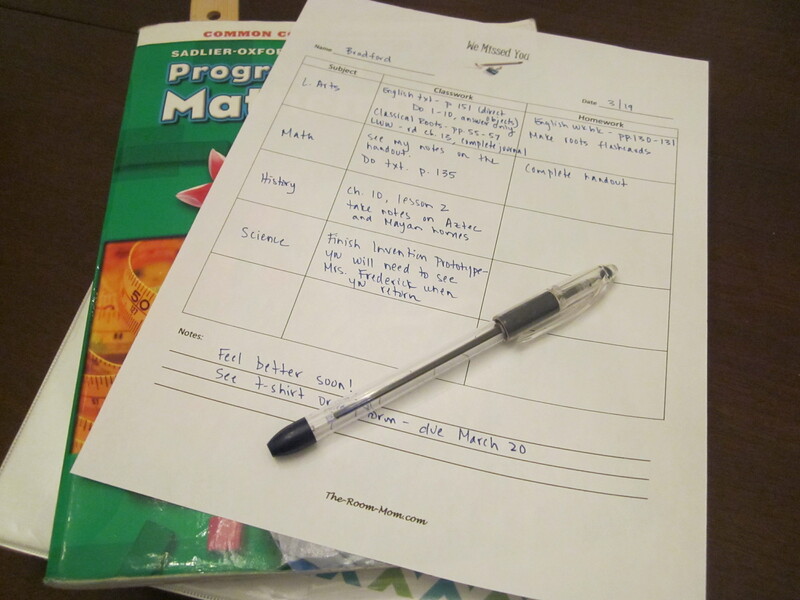 Don’t make the teacher go through the trouble of creating the make-up work packet when you know it is not possible for the child to do any of the work. Finish missed work as soon as possible. Typically, students have one day for each day absent to complete any work. If a student was sick for two days, he can have two days when he returns to complete all missed work. The longer it takes to catch up, the more opportunity there is to get further behind. Unexcused Absences: Unexcused absences are things like family vacations, checking out of school early for a long weekend, spending the day having a passport picture taken, or driving 100 miles for a Taylor Swift concert because it is your birthday. If the absence is planned ahead, and the teacher is notified, the student may have to complete any assignments or take any tests he will miss before leaving (if it is convenient for the teacher). Otherwise, the work will be made up the day the student returns. OR, the work will not be made up at all, and the student may receive a zero. Do not ask the teacher if a student will be missing anything important. YES, HE WILL. There is no way to replicate instruction when students are not in school. Even if teachers do give the page numbers from a textbook, it will never be the same as participating in the class discussion, listening to the explanation, or completing an activity with the group. Do not expect a list of assignments before you leave. If you want to take your family to Disney World at a non-peak time (which happens to be when school is in session), I am not responsible for making sure you have school materials before you leave. There is another reason too. I do not plan weeks ahead. I have a general idea of what will happen the next week in my class, but I never know for sure until the day before. I might give work to a student ahead of time, and by the time he returns, our class plans have changed based on student performance and interest. 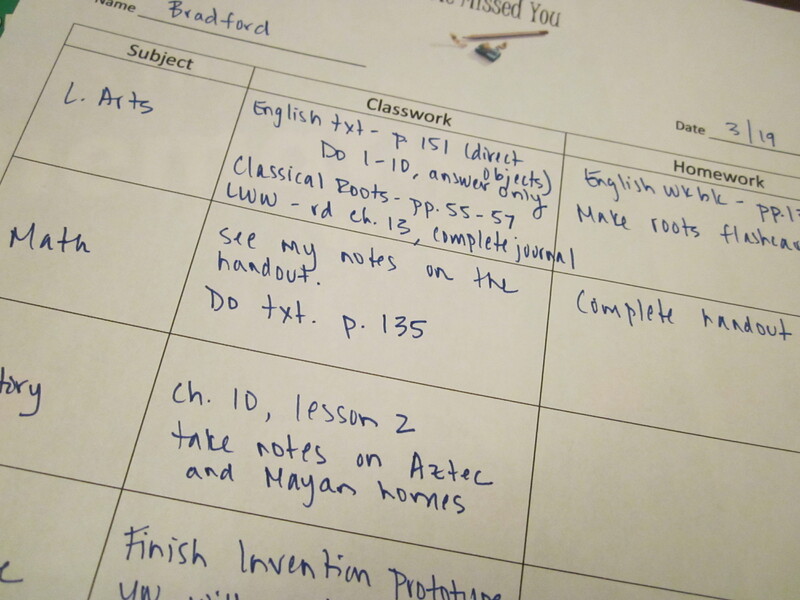 I may have replaced an activity with something different or decided to reorder lessons based on student responses. The classroom adjusts all the time. In my experience, the students who are really sick and need to be sent home won’t say very much. They get very quiet, stop participating, want to wear a coat or big sweater in the classroom, and don’t move very much. When this happens, my antenna goes up, and I run a mom check for illness. Kids who complain a lot about not feeling well usually should have eaten more breakfast, need a drink of water, need lunch, have a missing assignment, did not prepare for a test, or want to get out of class and visit the school office. I am unlikely to let a kid go home unless they are running a fever, have (confirmed) vomiting, or I have a note from a parent about potential illness before they came to school that morning. Be warned– if a parent sends a my-kid-might-be-sick note, but it is a kid who is frequently absent and kind of a hypochondriac, I will employ my best water fountain diversion tactics to keep him at school.